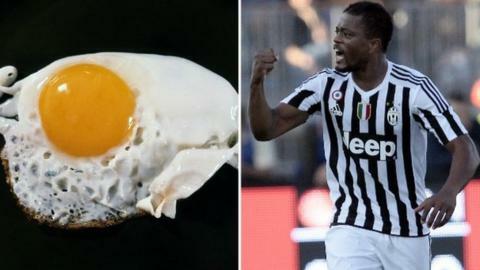 Juventus defender Patrice Evra has revealed the Serie A club discovered a food allergy he was unaware of during more than seven years in England. The 34-year-old, who left Manchester United in the summer of 2014, has since played 47 times for the Italian champions. "When I came here they said I'm allergic to eggs and I ate them every day in Manchester. I was vomiting in training at first," Evra said. "I went to the hospital and they told me I had been playing with an ulcer and I was lucky it was not bleeding inside." Where next on BBC Sport? Speaking to BBC Radio 5 live's European Football Podcast, the five-time Premier League winner said moving to Italy has improved his knowledge of the game, adding he would like to become a coach one day. "I have learned a lot about football - how to be more professional, even if I was professional in Manchester," added the France international. "Here in Italy, it is more like a chess game - you have to think about every move."